The Swedish direct-to-video slasher Insane was released on DVD on October 31, 2010 – Halloween night – but is currently being distributed on Youtube, and is free to watch for anyone. What is quite amazing for a Swedish horror film is it’s viewing numbers! In the 1990s, director Anders Jacobsson made one of the most culty of all Swedish cult films, Evil Ed (as seen as the avatar of our Facebook page). His 2010 film, the low budget Insane (co-directed by Tomas Sandquist) was therefore much anticipated by horror fans. The film attempts to bring back the terror of the slashers of the 80s. In our review we rated it 7 of 10 and described it as “…a good way to spend 90 minutes of your weekly slasher time. 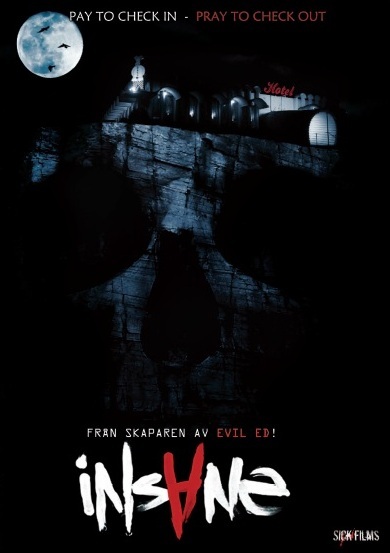 From the Nordic region, Insane is a job well done and one of the better slashers I’ve seen.” Now the film has racked up nearly four million views on Youtube, which are “insane” viewing figures compared to any other Swedish indie horror. In a further “insane” twist, the film has been picked up for theatrical distribution in India, 10 years after its premiere in Sweden! On October 15th the film will be launched at a press meeting in India, and in November it will run in 150-200 theatres, dubbed to Hindi by Bollywood actors. You too are welcome to view the full film, right here, right now. The film has English dialogue so just go right ahead and enjoy this ambitious Swedish take on neoslashing.